Moving into a new space can be a huge adjustment for any business. There are many small, often overlooked, details to consider and you still need to run your business. When faced with a facilities move or refresh, many companies will try to expedite the process to ‘get things back to normal and continue work’ as quickly as possible. When you’re up against a tight deadline, be aware of these common mistakes that can easily be overlooked while moving into a new space. Research shows that the performance of different teams, personalities, and job functions can be improved by the various spaces they work in. Optimize your team’s potential by designing a space for the way they work. “It’s easy to get caught up in ‘trends’ and to focus on how you want your space to look; however, it is important to step back and think about the day to day tasks of each employee and what type of environment is best for them,” says Jackie Skarb, BOS Project Design Consultant. You want your employees to have a space best suited for them. Do your employees sit at a desk most hours of the day? Try height-adjustable desks to promote wellness! 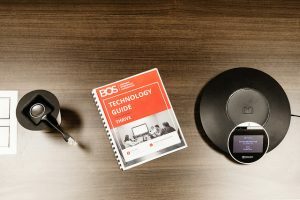 BOS workspace experts can help you identify and design product solutions right for your organization. Since furniture is usually one of the last items added to a space, customers often put it on the back burner and delay making decisions until later in the game. Many people aren’t aware that procuring furniture can be a complicated process. 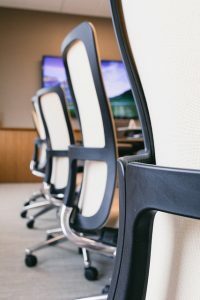 “Furniture purchases for the office are very complex and involve the coordination of multiple resources both internal and external,” notes Catherine Rice, BOS Corporate Accounts Project Coordinator. Furniture can come from a myriad for manufacturers and often require specials based on the unique features of your space. The process can easily take several months. If you start too late, you might end up with furniture that isn’t perfect for your space and budget. 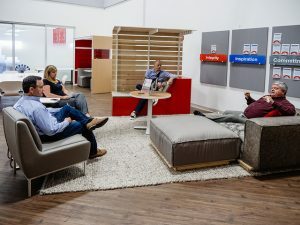 The idea of ‘your future space’ can be an overwhelming idea considering the need to envision what the ideal work environment for your team looks like. Will you opt for the more traditional office appeal of enclosed conference rooms and private cubicles or the more modern open plan with multiple collaboration and touch-down areas? 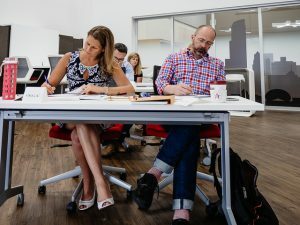 Recreational spaces are becoming more relevant to make the office feel like home, but be careful to honestly evaluate how realistic their use will be based on your work culture. “The open office probably won’t work unless management is willing to utilize the space. If the CEO doesn’t sit in lounge pieces in the open, the rest of the office will probably follow his or her example, ” says BOS Vice President, Kimberly Sullivan. While working spaces are certainly a priority, don’t forget to consider all the space that surrounds them! From meeting areas to training rooms, lobbies to storage spaces, be sure to look holistically at your entire space and remember to comply with any code requirements for your city. A simple mistake is forgetting about the future! You need to think about the growth of your company. Where will your company be within the next couple of years? You might need space for more staffing, and furniture that can support the constant technological advancement. “Sometimes our clients only plan for their current staffing level. They fill a space and have no room for additional employees as they grow,” warns Gary McIntosh, a Senior Account Manager at BOS. One of the most common mistakes is underestimating the time needed to complete a facilities move. Even if you feel ahead of the game, you may not be. “Businesses don’t move frequently and often the people tasked with managing the move haven’t done one before. From low voltage and power requirements to CAM and lease negotiations, it’s important to choose the right team – both internally and externally to ensure a successful move or refresh,” George Lucas Pfeiffer Director of Marketing. After reading this, it could feel overwhelming moving into a new space. However, BOS has a comprehensive move checklist to help you get started!